Are you ready to get fit in 2019? I am sooooo ready. Let’s just say Christmas Eve lasagna, frosted Christmas sugar cookies and a big Christmas dinner have convinced me I need to dive in on my Fearless diet plan. 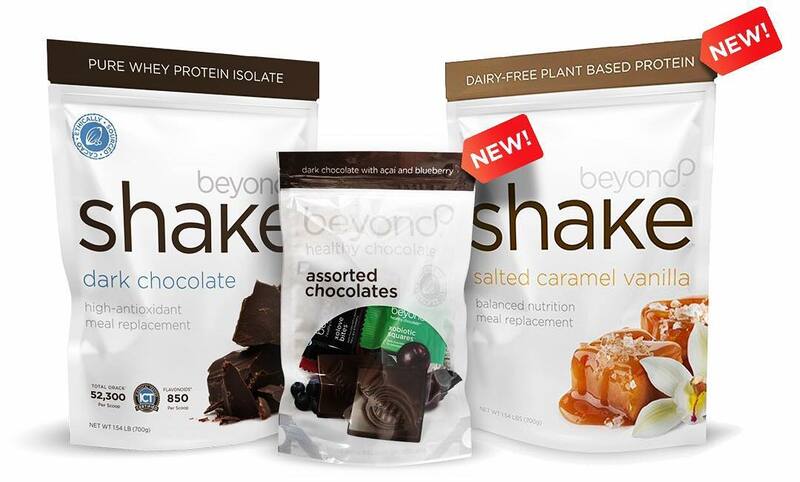 The best part of the Fearless chocolate diet is the Beyond Chocolate Shake. This shake is delicious. I make mine with organic unsweet vanilla almond milk and 1 cup of ice but there are so many options including frozen banana with a touch of peanut butter, fresh fruit or even cold coffee and a dash of vanilla. It tastes so good and keeps me full for four hours. For me, I notice within 30 minutes of drinking it how much better I feel. I can honestly say there is nothing else I have had as a meal that improves how I feel so quickly. If you are looking to lose 5, 10, 75 or more pounds, this Fit Kit is just what you need. It is such a deal. The Fit Kit gives you one bag of the Beyond Chocolate shake and one bag of the Beyond Salted Caramel Vanilla and a 16 piece sampler of all the Beyond Healthy Chocolates for healthy alternative when you have a craving. (Each bag offers 28 servings giving you enough for 2 meals a day for 28 days!) Normally priced at $170, you get the entire Fit Kit for $100!!! (United States pricing/Canada $105) Now that is a deal. No excuses!! Get ready for a great 2019!! This is an amazing price! Set yourself up for SUCCESS in 2019! Be FEARLESS!! If you choose to start the Fearless diet with us on January 3rd 2019, you will also have access to weekly support, our online private facebook support group and the Fearless weight loss journal to keep you focused and on track. When you price out the Beyond Fearless diet, not only is it more affordable then most other plans, it was featured on the cover of the American Journal of Bariatric Medicine, the Bariatrician. The average person lost over 31 pounds in just 12 weeks following this plan. (If you would like a copy of the white pages for this study, just comment below and we will email it to you) If you follow the Fearless diet, which includes replacing two meals a day with the Beyond protein shake, a normal healthy meal, Xe Lite energy drink and eating healthy belgian chocolate, you can expect to lose 10 pounds in 28 days. Slow and steady weight loss is a healthier option and better if you are looking to keep off the weight long term. For those with chronic conditions, you may also notice a benefit because this shake and chocolates are full of antioxidants and cocoa flavonoids. Just one Xobiotic chocolate square is equal in antioxidants to over 1 pound of raw spinach. Why this matters? Antioxidants are known to lower inflammation. Inflammation causes well over 200 diseases including cancer, heart disease, arthritis etc. This shake has been a lifesaver for me with fibromyalgia and CFS/chronic fatigue. I personally have more than 10 pounds to lose. If you also have more than 10 pounds to lose and want 2019 to be the year you get fit and healthy, join me! Together we can do this! I am Lynette Henk of Three Sons Marketing LLC, in Babcock Ranch, Florida. We can be reached at (941) 676-7300 or visit our online website at HealthyChocolateFix.com. We are always here to help! SW Florida Can Lose Weight With Chocolate! Great deal! I am stocking up.